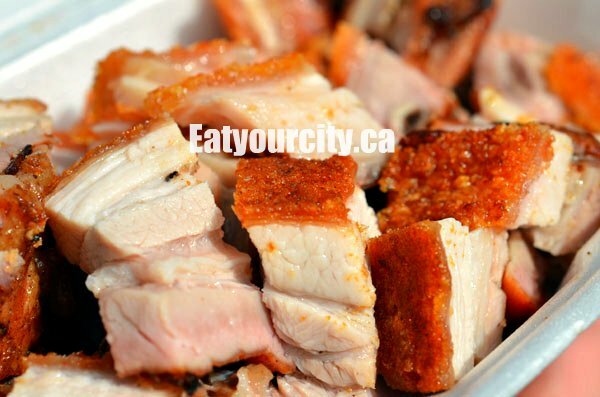 Eat Your City: Parker Place Meat and BBQ, Richmond, BC- long wait for this BBQ pork! 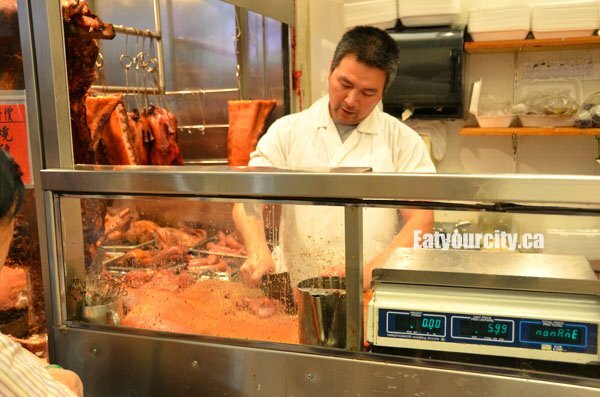 Parker Place Meat and BBQ, Richmond, BC- long wait for this BBQ pork! After hearing that Parker Place Meat and BBQ had "the best" BBQ pork in all of Vancouver, we had to head to Parker Place to check it out. It looked promising, as there was always a steady stream of customers - with the lineup seemingly never decreasing in length. People were saying the BBQ pork was so good here, you had to eat it as soon as you get it in line, rather than head home to nosh on it. After waiting for about 30min in line, we finally got to place our order. Parker Place Meat and BBQ sells a variety of Chinese style BBQ meat items - BBQ duck, pork, char siu as well as soya chicken. We eyed the glistening goods while we stood in line, teased by the tantalizing savory smells, and entertained by the staff who chopped up the BBQ items into bite sized pieces at an insane pace. His skill with the butcher's knife was something to be admired as he would chat up customers while his knife was a blur as he chopped up meat into uniform pieces at a crazy fast rate... thankfully, he's behind a large splatter screen as the cooked meat juices splatter nilly willy as we hear the rhythmic almost machine gun like speed of the knife thudding into the cutting board. Was unfortunately, a bit over hyped. The skin was nice and crisp, though not evenly so - indicating an uneven pricking of the skin during preparation prior to it getting popped in the oven. The meat was strangely not cooked evenly. Biting into a rib piece, the upper half was moist and tender, while the bottom half of the piece was dry and very chewy. There was also uneven seasoning distribution, as it was skimped, so the meat was bland rather than being seasoned with a nice hit of five spice. The char siu was actually very good - moist juicy cut of pork is marinated in a sweet hoisin sauce and roasted to a rich reddish hue. 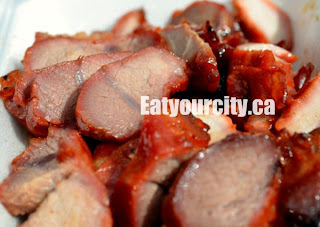 The char siu was also flavorful, with a good balance of savory and a sweetness from the marinade and maltose based glaze. The super friendly and happy head chopper guy also made quick work of the char siu, chopping up our large order within seconds, while chatting about any topic under the sun with us and surrounding customers. The soya chicken - an entire chicken slow cooked in vat of sweetened soy sauce is moist, with a few pieces overcooked. The flavoring penetrated throughout all the pieces of meat, lending a salty sweet flavor to each bite as well as a rich caramel color to the skin. While not the best we've had, its not bad either. 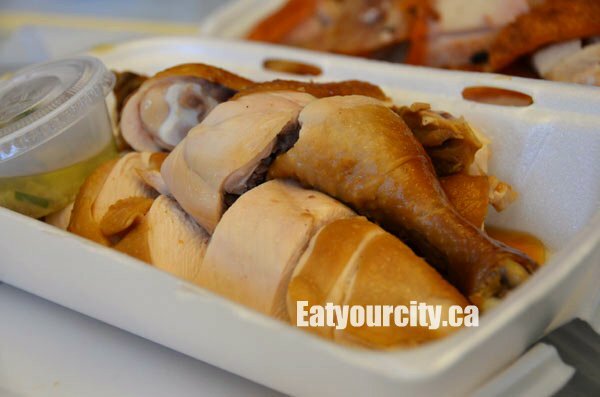 Its oddly served with a small container of grated ginger root and diced green onions in oil dipping sauce - which is usually used for salt water slow cooked chickens. There has been debates about the best place for this fare in Vancouver (or, specifically here, Richmond). If it wasn't because it is in Richmond, I would certainly go more often to HK BBQ Master, located below (no typo) SuperStore in No 3 Road. Otherwise, I tend to hang in Burnaby's Crystal Mall. There are a couple of such places and, for the most part, I am OK with their offerings. Not necessarily as good but don't have to deal with that crazy driving in Richmond! Certainly BBQ meats at Parker Place is one of my favorites, tasty and less salt. Unfortunately, staff at cash counter wasn't friendly!��. My wife and I went today to try out BBQ meats at store by Superstore, meats wasn't good, bad and salty, soup wasn't worth eating! Will not go there again. I really like the roasted pork at Parker, I usually get very uniform crispy skin so I'm hoping it was an off day! I agree with the one near superstore not being as good as parker! love the bbq product at parker place. i have tried many places but not the same. Never had awesome roasted pork anywhere like parker place. Your review of the BBQ roasted pork is very surprising to me. From my numerous visits, the skin is always crispy and the meat is well seasoned. Sometimes, I find it overly so. It must've been an off-day. Canadian Chinese are slightly better off in customer service than counter part in San Francisco (SF), and Los Angeles (LA) Chinatown. In SF Chinese restaurant, one of the special on that day was noodle with lobster, but the lobster was stale, so we ate the noodles only, worry that replacement may be tampered with unhygienic stuff. Despite of the stale lobster which I complained earlier, the old Chinese lady demand more tip upon payment. In Anaheim, Grand China restaurant charged for tea and worst add on mandatory a service charge of 18% on top of foods ordered. Several years ago my family and I went to a restaurant across Crystal Mall, name as Chong something.., and we were being riped off with a plate of vegetable costing $30.00. I learned to ask for the price first. I've always thought there was a tea charge no matter where you eat - whether its in Toronto, Edmonton, Calgary, Vancouver, LA, or Hong Kong. And if the price tag says "market price", its always a good idea to ask first so you're not surprised later.